In Which I Complain About Drivers. If you don’t live at our house, then you haven’t been getting the day-by-day updates that we’ve been getting, so you likely don’t realize that we’re ten–count ’em! !–just ten days away from M acquiring her learner’s permit. She is beyond excited. She predicts that she will be an excellent driver. Along the way, I have picked up a few tips that may be useful for those of you who will have new drivers in their house in the future. First, at our school, at least, kids can take their written driver’s test up to two weeks ahead of their birthday at the high school. That eliminates the extra stress of having to take a test (albeit an easy one) on your birthday, and of course reduces your time at the DMV. M took (and passed) her written test last week. Second, I learned that locally there’s a highly-in-demand, 5-hour Driver’s Ed class run by Martin, Harding, & Mazzotti which is free. This is excellent because apparently tons of kids get closed out of our high school’s Driver’s Ed class, and you need to take something before your road test. So hopefully we’ll get into one of those. Anyway. M is very excited about driving, and I anticipate that we’ll spend part of her birthday driving together. Several weeks back she was joking about how Cute W and I were going to be so awful as driving coaches, each in our own awful way. It was pretty hilarious because she gave spot-on impressions of Cute W becoming quite noisily alarmed and of me trying to act all mellow and Zen. We’ll see how it goes. If it’s awful, we’ll just outsource a few hours of teaching until it becomes less terrifying. I expect that she’ll be just fine. But like parents in Days of Yore (assuming that the “Yore” in this case is not so long ago that they’re pre-automobile), it’s not so much that I’m worried about her, but all those other stupid drivers. We have a huge supply of stupid drivers in our neighborhood. So much so that I felt compelled to take photographs for the purposes of ranting about them. It is a lovely boulevard. 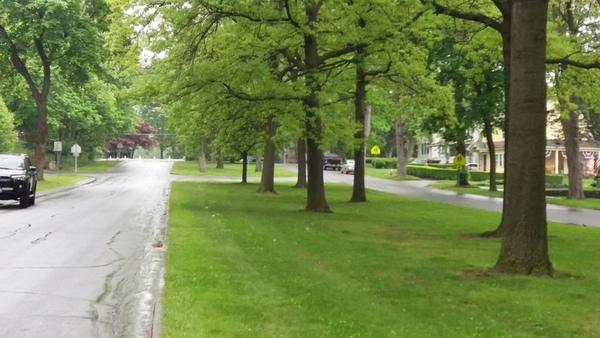 Each side of the boulevard is one-way, and the streets are pretty wide, as you can see by that parked car, which is probably partly on the grass, but still: you could probably fit two-and-a-half vehicles side-by-side on the street if you wanted to do so. And then there are plenty of opportunities to cut through the boulevard or make a U-turn, like in the bar of the “H” you can see connecting the cross street above. Okay, so first? People drive way too fast on this road. Which I’ve mentioned, along with my occasional passive-aggressive choice to stay on the road just to piss off speeders. Recently I was in front of a particularly egregious speeder who clearly wanted to take advantage of the road’s width to pass me (#illegal) and I gently swayed the Rogue to the left and to the right, repeatedly, to thwart him. Yes, okay, he probably could have road-raged me to do death, but it is hard to resist such an easy, mild-mannered way to poke the proverbial bear while preventing neighborhood speeding. But honestly? The worst is people’s inability to follow the most basic signage. Generally speaking, drivers on our boulevard have the right of way, and all of the side streets have stop signs. Now, because it can get busy, the conscientious driver who’s trying to get all the way past our boulevard will stop at the stop sign, proceed to the median area, and then pause again to make sure there’s no traffic from the other direction before they continue. Like, it’s not hard, people. First, many people are not very good at stopping. 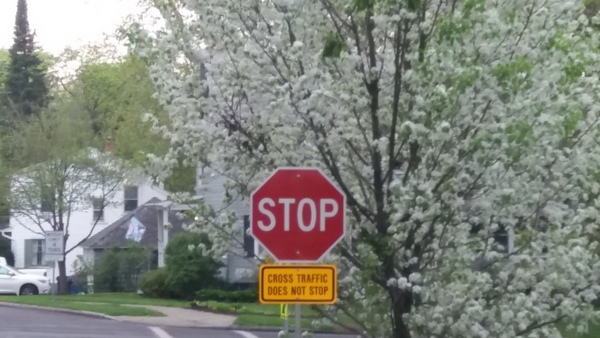 That’s right: if this stop sign alone doesn’t convince you, perhaps it would help if we explained that the people barreling down the street from your left have no stop sign at all? They will not stop. Nobody’s asking them to stop. They have no good reason to stop unless the reason is your stupid car, directly in their path. Also, perhaps we could point out that people walk here? People walk here. It’s a neighborhood. Maybe you could act as if people could potentially be walking in this neighborhood. This is what you see just beyond the stop sign in the image above, assuming you’ve made the appropriate, responsible choice and actually stopped at the stop sign. For your viewing pleasure, allow me to call your attention, as well, to the yield sign. Why, yes. If you’ve successfully navigated past the stop sign and the first line of traffic, one would think that you’d also be smart enough to take a moment in the median to pause before crossing in front of another line of traffic. 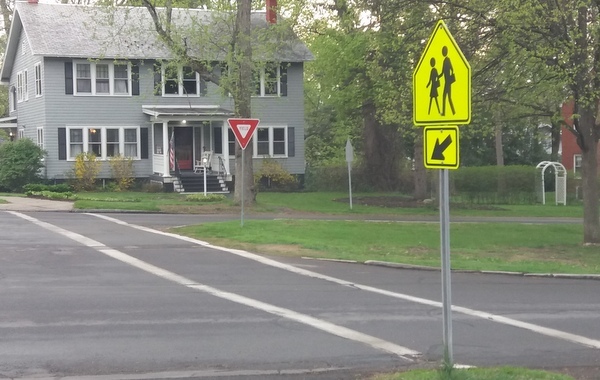 Sadly, this wasn’t something that most people could figure out on their own, so the yield sign is a new addition on each side of the street to remind drivers in the median that they might want to be cognizant and respectful of oncoming traffic before just jumping in. So, what this means is that, if I find myself at that stop sign that you see in the picture above–and I often, often do–I’ve got cars coming from my left on the main boulevard, often a smidgen too fast, and proceeding past me and onward to my right. Meanwhile there’s often a car facing me because it’s coming from the median, usually with the intention of taking a left onto the boulevard and proceeding past me and onward to my right as well. And, since I am at a stop sign, I stop.
. . . And I know, right? That is a lot of talking. And in all that time they are still standing there, not going, and it is making me crazy but I am also hugely stubborn about it, because I am trying to get them to just follow the rules, because chances are that we’ll meet again. But yes, okay. It takes longer. In fact, often, in the meantime, someone else has come around the corner and gotten onto the boulevard where they clearly have the right of way, and so then we are both screwed. I realize that I’m sounding like a freak, here. And I think it’s lovely when, say, traffic is all backed up on Balltown and someone is kind enough to let me in. But there it’s really necessary. There’s no need for the niceties at this stop. And meanwhile what my grandma used to call a “nice fight” is a massive time-waster. Also, and perhaps freakier? I hate it when drivers stop to let me walk in front of them. It is some combination of feeling like I’m on display and feeling like I have to move faster, but it makes me crazy. I will make elaborate efforts to appear as if I have no intention of crossing the street just to forestall random drivers’ efforts to politely let me go ahead. Possibly I should seek counseling? I dunno. In any case, I know that I probably should appreciate anyone who’s conscientious enough to pause on our crazy-pants street. Also, by the high school? It is pure insanity. I have seen so many drivers, adults and teens both, drive right through 4-way stops without even slowing down. Which is crazy because there are a ton of cars and students walking and people walking their dogs. It is so dangerous. I think they should just have a cop stationed on Rankin at all times to bust everybody. So we are surrounded by drivers, some of whom are competent, and many of whom are crazy. For better or worse, soon M will be joining their ranks. I’m with you! Saturday night I screamed at a driver who came down our suburban street at 45 miles/hour. I wish I had been quick enough to take a picture or get part of his plate number. Then yesterday a car with Alabama plates failed to yield to traffic on the circle. Even if he’s not familiar with the rules of a traffic circle, the yield sign is right there, but he plowed right through it. I’m pretty sure people in Alabama know how to read. Anyway, this is why when my son is old enough to drive (in 6 years, gulp! ), my husband will be handling it. I’ll be way too nervous. Katie: When y all come to GA maybe M would like to learn to drive a stick shift in our BMW convertible? This was met with a gasp and immediate agreement that yes, she would. I had to laugh at your comment about people stopping for you at crosswalks — I feel the same way! The worst is when someone kindly stops but everyone behind them just drives around so you’re both stuck and it’s awkward. I work in Saratoga and have noticed over the years that during the summer months if someone stops to let me cross it’s usually a driver from NJ. Are they really strict about it there? Ha, I used to live in NJ and didn’t notice it being particularly strict. But I WAS just in a Boston suburb and they were clearly strict there. I made the mistake of loitering near a crosswalk while turning back to call out to my daughter, and the driver approaching, who had stopped, flipped me the bird and yelled at me for not crossing! Um. . . not friendly. It’s a law that you HAVE to stop for a pedestrian in the crosswalk! so Katie, just walk and be gracious that the driver is following the rules. Don’t you LIKE rule followers?? Yes. I’m being snarky because I’m one of those nice, rule following drivers that have stopped for you in the crosswalk and been rewarded with a scowl. I know, I remember that time I scowled–I’m sorry! But I’d prefer to pretend like I’m not waiting to cross so that the drivers aren’t under any moral or legal obligation to stop. . . I know, I know. . . this is all me being a freak.